The importance of SD cards and internal storage is waning in the face of the greater options for "cloud storage." For those who aren't aware, cloud storage allows you to upload & back up your data to an online source, saving you precious gigabytes of data on your Android device. 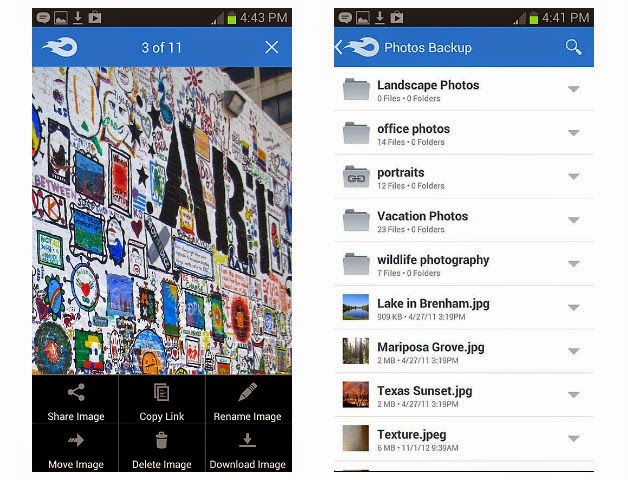 Here is our list of the best cloud storage apps for Android . We're starting with an obvious one. Google Drive is just so hard to overlook because it offers 15 GB of no-questions-asked free storage and never fails. Google Drive shows a nice history of your changes too, you can allow others to view and edit your work and it offers support for many different file types. It's an obvious solution for anybody with a Google account because it's so seamless and requires very little time or management from the user. As a side note, the Google+ social network app provides a pretty excellent cloud storage service, allowing you to store an infinite amount of pictures (at less than 2048 pixels) and videos (under 15 minutes long and no more than 1080p resolution). Not too shabby. 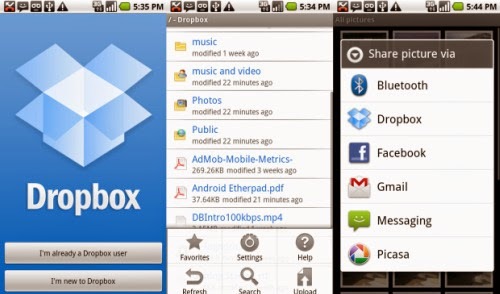 Dropbox has been a firm favorite on Android for many years now. It has a relatively 15px storage capacity - a paltry 2 GB to begin with - but this can be expanded up to 16 GB in various (and fairly simple) ways. Dropbox is fast, intuitive and free, with some unobtrusive automatic backup features perfect for those who want to take quick snaps and then view them on their desktop computer in a flash. It's a great overall package if you can invest a little bit of time expanding the initial storage cap. Box is available free in the Google Play Store and is very easy to use, offering 10 GB of free space with a 250 MB upload limit. Beyond this point you are asked to pay 10 USD per year for 25 GB of cloud storage. Box is perhaps the most basic application of our list because it has no super special features: Box is there simply to upload, download and share files, although it is possible to edit and comment on files in the cloud. Box also has a widget that notifies you of any changes to shared documents. SugarSync offers 5 GB of free data as a 90 day trial, and after that the cheapest package is 9.99 USD per month for 100 GB. But it is really simple and fast! This cloud application differs from others because it offers more payment methods, more storage space in the cloud, and it allows you to invite friends to use your files for example, and is also connected to social networks. Personally, I think this is the most intuitive online storage app I've ever tested, especially for inexperienced cloud service users. 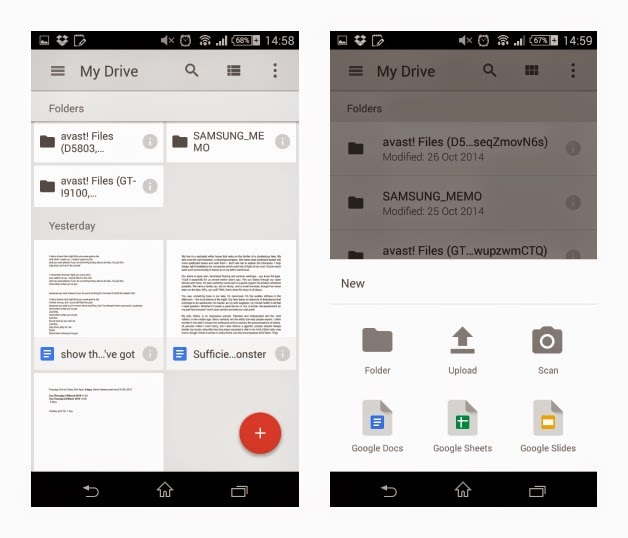 Instead of a series of folders, we are shown a clear menu with quick options such as Photos, Shared Documents, Private Documents, etc. 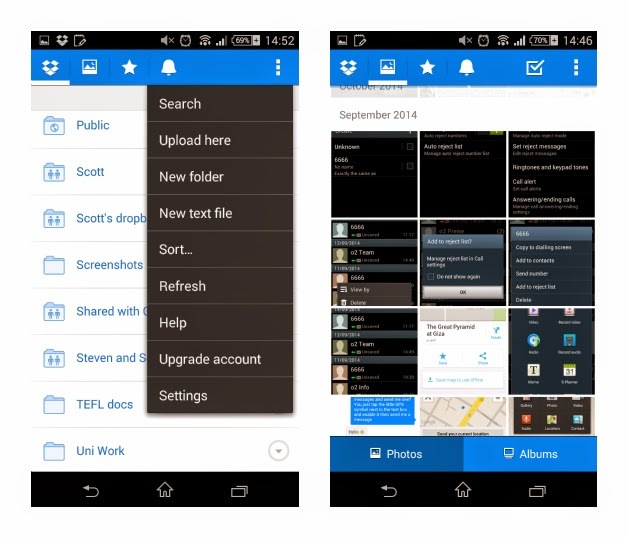 The app's simplicity and clarity certainly helps to better locate each file. With this tool, you can really say that you are using cloud storage. MediaFire serves it up on a platter, because this application offers up to 50 GB of free available space, which is perfect for saving or sharing music or videos. But all that glitters is not gold: there is obviously critical points too. First of all, you only get 12 GB to start and have to earn the rest (or you can pay $2.50 US/month for 100 GB) and although its interface is clean the menu is a bit confusing. It has all the basic functions to download images, download and share archives etc., including those off your camera, which saves a lot of time. But another disadvantage is that the size limit for each file is 200 MB, at least in the free version. Paying more of course will earn you access to more privileges. 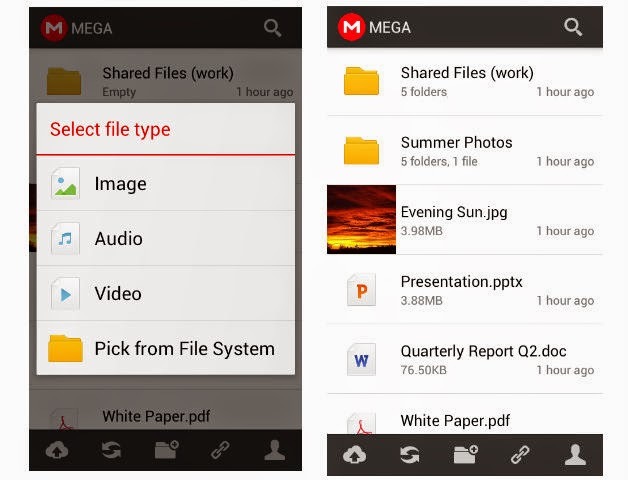 Mega is an application that provides 50 GB of storage to users upon arrival, free of charge! This is one of the best offers on Android and is based out of New Zealand, the Land of the Long White Cloud. Everything you upload is encrypted and the encryption keys stay with the user, so there's no need for privacy concerns here. You can manage your Mega account, download files and even synchronize your camera directly to your account to automatically obtain a copy of the images and videos when you connect it. For now, it is pretty basic, but it should be updated soon, and it is offering you 50 GB of genuine free cloud storage. Choice bro!